This past Wednesday, I was invited to Ariana Restaurant for a media night. The ignorance clearly lies with me as this restaurant is an Old City stalwart with almost 20 years of service under its belt. 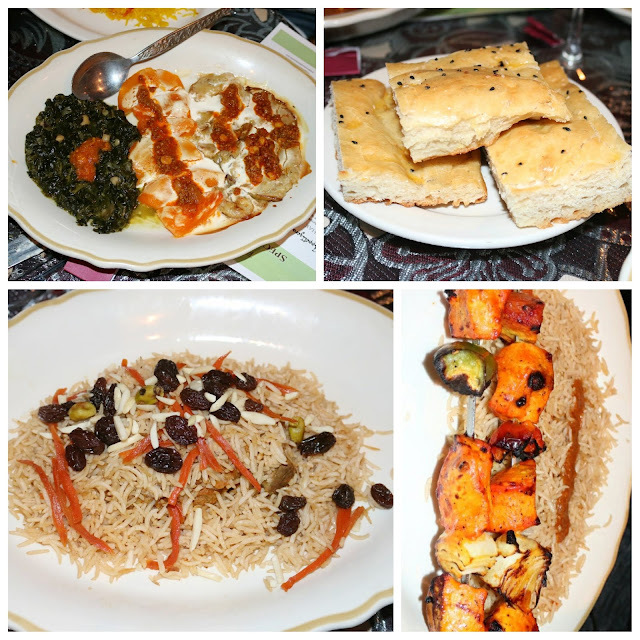 'Ariana' is the old name of Afghanistan and the Hashmi family along with owner Beheshta have been serving Afghan cuisine to Philadelphia since 1999. 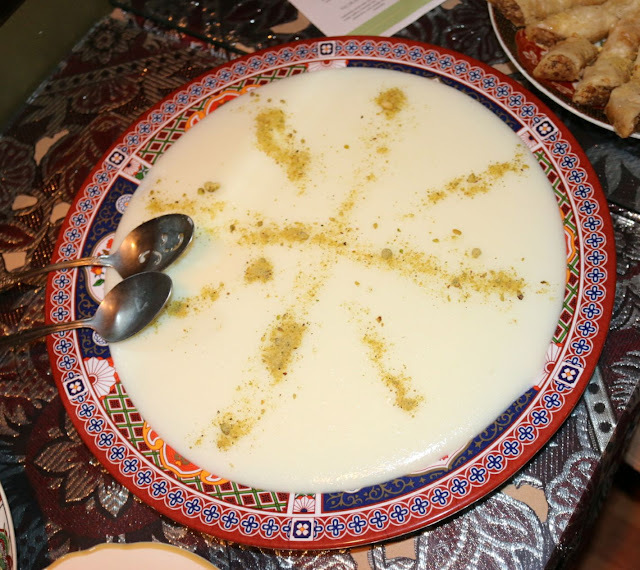 A big part of Afghan culture is hospitality and it clearly shows though Beheshta's passion and cooking. 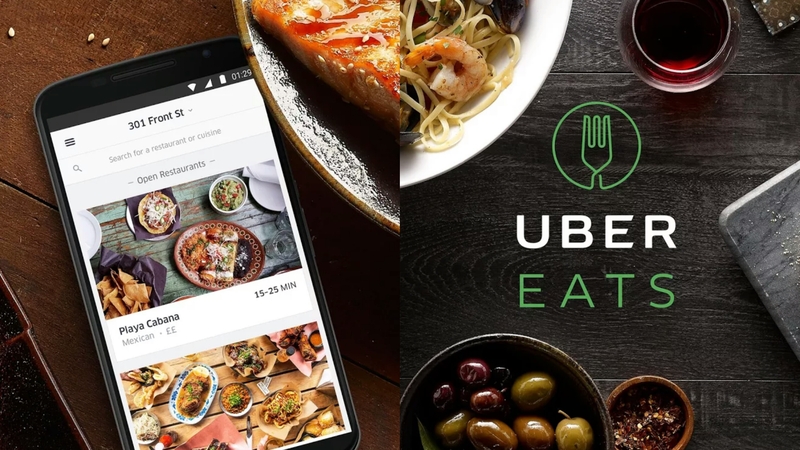 A melting pot of eastern European influences impart flavor and soul into the dishes, with Persian, Indian, Asian, and Mediterranean cultures all playing their part. Think less spicy then Indian, but with the familiar flavors of the Mediterranean. Along with wine (Ariana is BYO!!!) 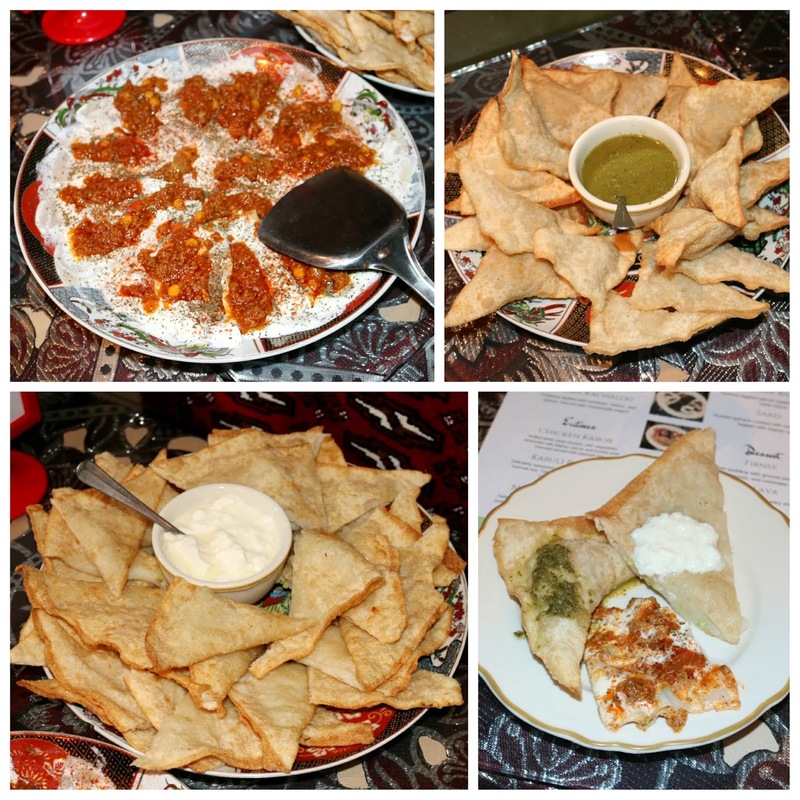 to start, we enjoyed several Afghani appetizers. Aashak are steamed scallion-filled dumplings topped with a spicy yogurt and mint sauce, with fresh mint sprinkled on top. Delicious and a definite must order. 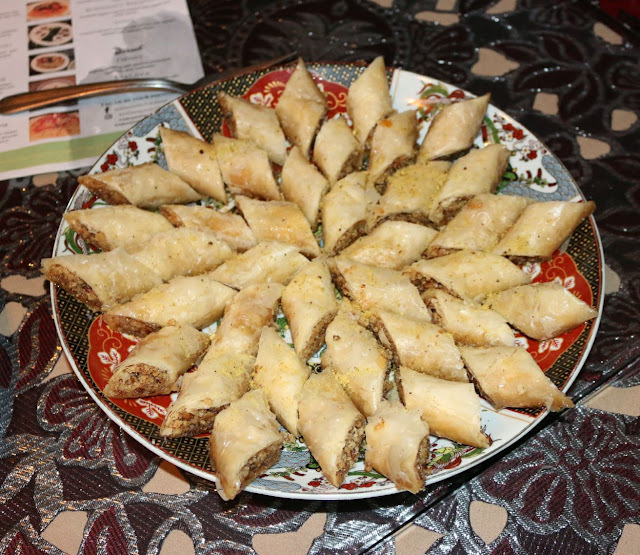 Sambosa were deftly fried and stuffed with chickpeas, ground beef, and a tempered hit of spices, served alongside a cilantro sauce. Bulanee were crisp turnovers filled with scallions and herbs - perfect to top with the accompanying yogurt sauce. I'd definitely recommend starting off your meal with a few of these bites. With our mains came fresh bread that had a nice crisp texture on the exterior, yielding to a light, fluffiness within. Slightly sweet, it was perfect to sop up the vegetarian sides that accompanied our entrees. These sides included spinach sauteed with sun-dried lemon and garlic (sabzi), pumpkin cooked down and topped with yogurt (kadu), and seasoned eggplant with tomatoes (palow). For my main, I opted for Afghanistan's flagship dish - the Kabuli Palow. Lightly seasoned chunks of lamb were interspersed throughout a lovely mix of brown basmati and topped with almonds, pistachios, carrots, and raisins. A delightful mix of savory and sweet. To end our meal, we were treated to two desserts. I've never had firnee before, but I enjoyed the texture that was slightly firmer than flan but just as enjoyable. The rose water permeated throughout with some texture coming from the ground nuts. And who can say no to baklava, with the thin layers of pastry dough housing plenty of syrup and walnuts. 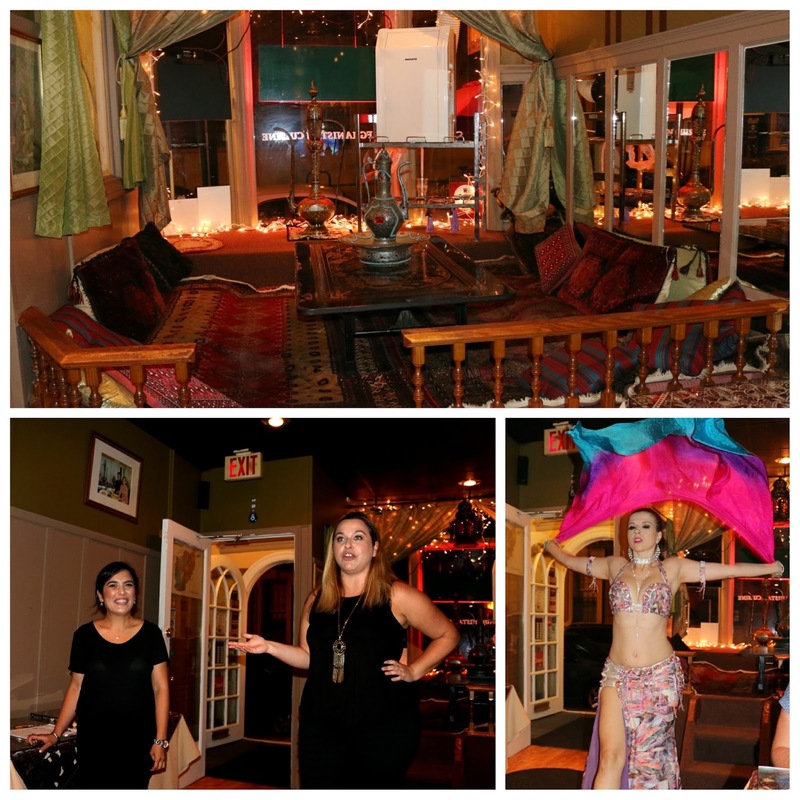 In addition to being a BYO, Ariana also offers late-night hookah and they're able to hook(ah?) you up for private events, including entertainment. On this particular night, we were treated to a performance by Ewelina, a local belly dancer. She had most of the patrons up and dancing by the end of the night, including yours truly (I'll spare you shots of that). And while I'm sure we all have a favorite spot in Old City, if you've never had Afghan cuisine or are looking for great food beyond your typical haunt, be sure to hit up Ariana. FTC Disclaimer: Special thanks to Beheshta of Ariana Restaurant & the Philly PR Girl team for hosting me. Regardless, my opinions are mine alone and, therefore, unbiased. This Ariana Restaurant Media Event was the best and the theme they had were super Amazing. I really had a great time there. Wonderful post!